One year ago, Greg Schem bought Channel Islands Landing Marina and Boatyard from longtime owner Frank Butler. During this time, he has invested $1.5 million as part of the ongoing revamping of the facility. Under Butler’s ownership, the marina was completely renovated including increased boat slip capacity from 91 to 157. New restrooms/shower facilities and a laundry room for slip holders were installed. All new concrete docks and American Disabilities Act (ADA) compliant ramps were part of the renovation, including a new harborside promenade landscaped with drought-tolerant plants and modern lighting to increase and improve public access to the east side of the harbor. The cost of the project completed in 2011 was $8.5 million. “I am not only continuing the improvement of the facilities, I am going beyond the previous scope of work,” Schem stated in a recent interview. Real estate investor and developer and president of The BoatYard in Marina del Rey, a full service marina with dedicated boat services on site, Schem is always looking for ways to improve services for boaters. As a lifelong boater, Schem decided to focus his energies on the boating industry full- time. Since buying the 14.5-acre parcel, Schem has increased staff to improve customer service on site. So far, he has hired an additional 10 employees and will be hiring about 16 more as the project moves forward. “As a boater, I see things from the waterside. Most developers around the marina in Marina del Rey think, nice view when they develop a property. But they know little about what boaters want,” Schem said. 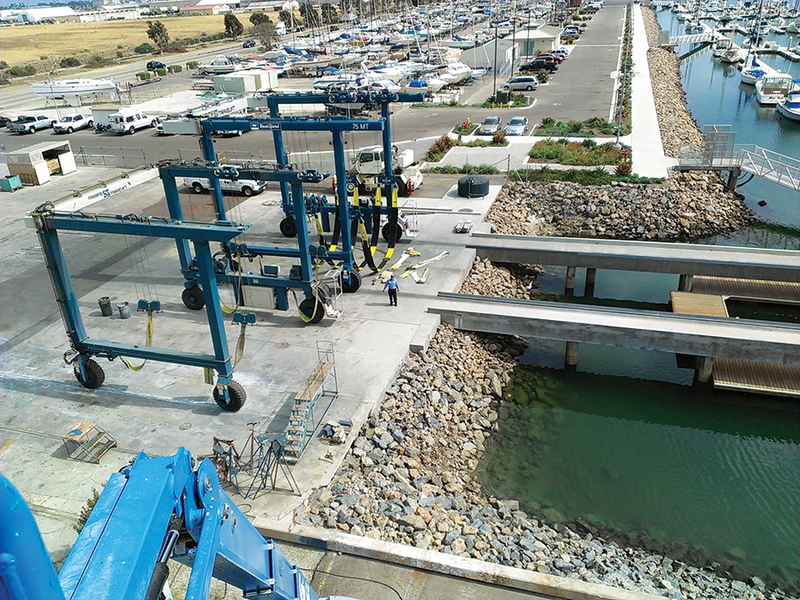 In addition to the two marinas and boatyards, Schem operates the Marina del Rey fuel dock and mega-yacht facility with capacity to berth boats up to 300 feet. “People marvel at the sight of these yachts, and many take their boats and skiffs out just to take a look at them. I want the Channel Islands Landing Marina and Boatyard to be the best in Ventura County,” Schem stated. In the past year, Schem has removed derelict boats from dry storage, installed all-new fencing and block wall that faces Victoria Blvd., and put in new 50-ton and 75-ton lifts. He also removed the old cranes for hoisting dry storage yachts in and out of the harbor and installed one “stiff arm” crane and a boom crane, at a cost of $150,000. “The boatyard needed proper drainage, so we are putting in a central clarifier that will take out all the pollutants and leave zero discharge; nothing will spill into the harbor, on the street or the boatyard,” Schem explained. Additional construction plans in the works include a new administration building near the main entrance to the marina and one more next to the dry storage that will include an on-site mechanic and storage lockers for dry storage boats. “The construction plans are moving forward and will cost an additional $1.5 million,” Schem said. ← 2015 offshore fishing season off to a great start!